While I adore salads all year long, there is just something about winter salads that I can’t get enough of. The variety of flavors that add texture, color and of course bursts of flavor to my winter salads continue to inspire me daily to come up with new creations. 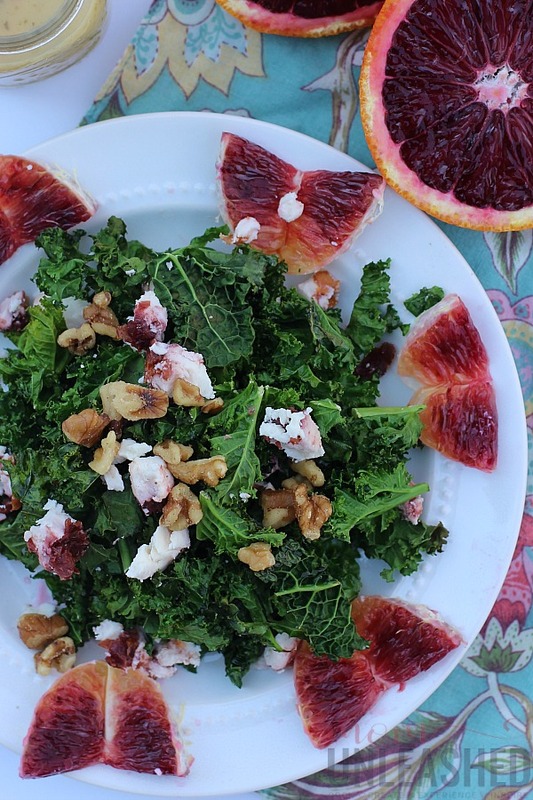 Recently, I’ve been crushing hard on everything blood orange and of course I’ve been eating plenty of kale so I decided to take these to favorite ingredients and combine them in a unique way to create a crispy kale salad with blood orange, walnuts and goat cheese. While the flavors of this crispy kale salad are enough to make my mouth water, what really sets this perfect winter meal aside is that instead of using regular kale, I took things to a whole new level by oven frying my kale before adding it to the salad. This simple twist gives every bite of this salad a next level flavor that I promise you won’t be able to get enough of! So let’s make it why don’t we? 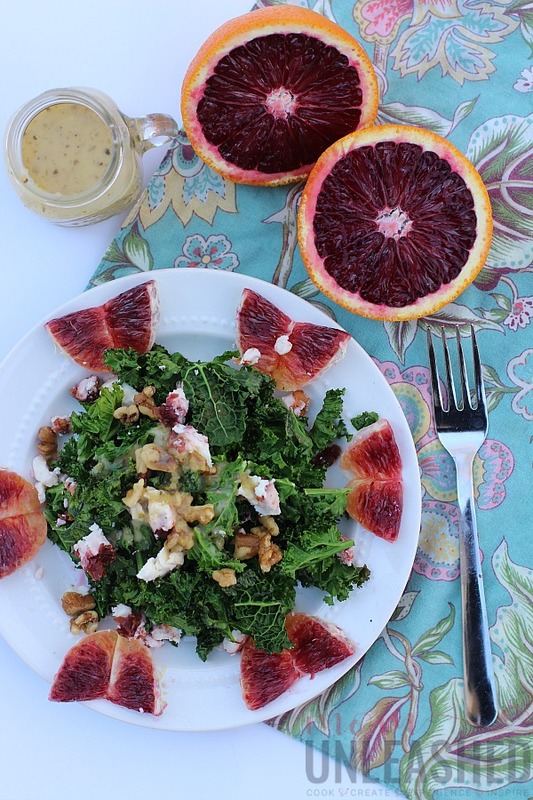 This Crispy Kale Salad combines oven fried kale, blood oranges, walnuts and goat cheese and tops it all off with a citrus dressing to create winter salad perfection! Citrus salad dressing of choice. Wash the kale and pat it dry. 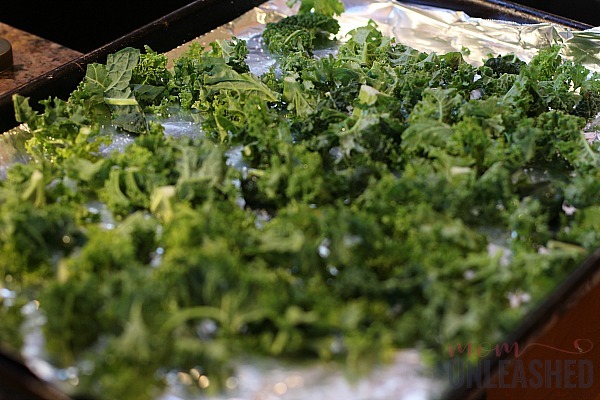 Spread the kale out on a baking pan and sprinkle with olive oil and sea salt. Bake at 450 degrees for 7 minutes or until crispy. Cut pieces of blood orange and add them to plates. Pile the crispy kale in the middle of the plate. Top with goat cheese and walnuts. 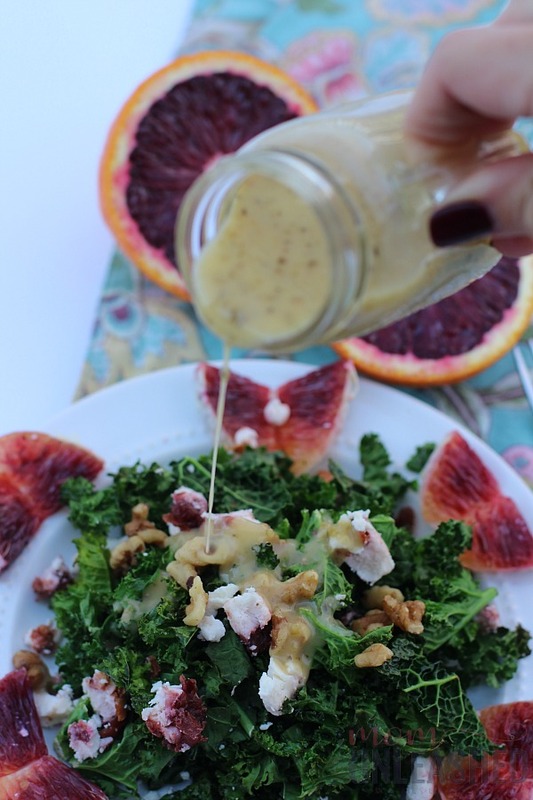 Drizzle with citrus dressing and enjoy. 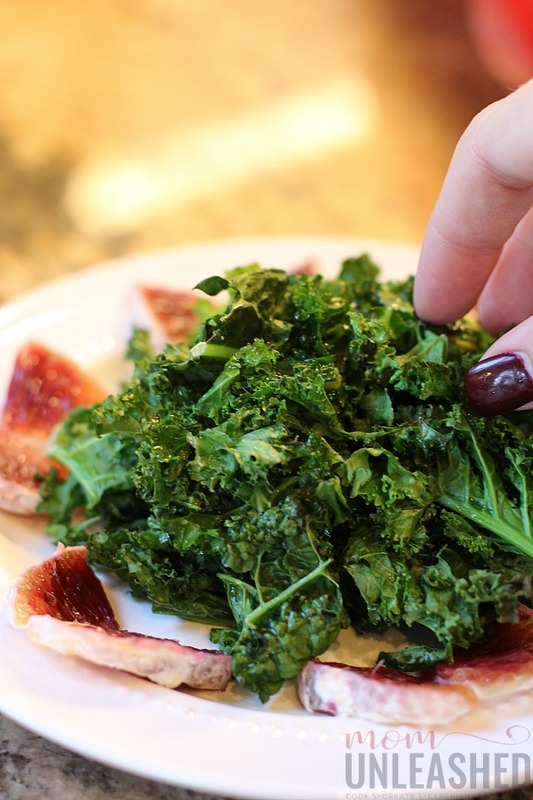 This Crispy Kale Salad is so easy to make. To start, I washed my kale and patted it dry. Then I spread it out on a baking sheet and drizzled my olive oil and salt over the top. Once I had massaged the olive oil into my kale leaves, i put it into my preheated oven and cooked the kale at 450 degrees for about seven minutes, just long enough to get it crispy. While my kale was cooking, I cup up my blood orange and put it on my plates. Then, as soon as my kale was crispy, I piled it on the middle of my plates. With my kale in place, I added my goat cheese and walnuts to the top of my Crispy Kale Salad and poured my citrus salad dressing into a container. Then I served up my Crispy Kale Salad along with my side of dressing so that the dressing could be poured onto the kale immediately before eating, preventing my crispy kale leaves from getting soggy. 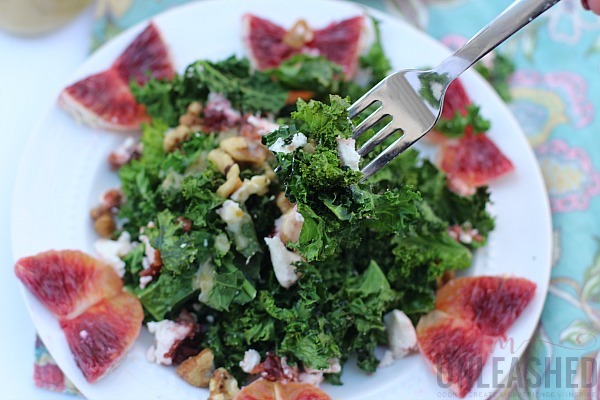 This Crispy Kale Salad with Blood Orange, Walnuts and Goat Cheese is seriously so delicious and can be used as a side of you can even add shrimp or chicken to make it an entire meal. No matter how you serve it, I can promise that it delivers a crunch and flavor combination that you’re sure to fall in love with. Now tell me, what’s your favorite winter salad? This would be the type of salad I would serve at our women’s luncheon. The men in my family might give it a try. Kale is something that I regularly eat and this looks delicious. I’ve found that you really need to massage the kale to remove some of that bitter taste. I just love blood oranges! I didn’t think to put them in a salad. What a great idea. I’ll be trying this for sure. Amber Myers recently posted..What’s In The January YumeTwins Kawaii Box? I LOVE blood oranges but I cannot find them anywhere! I’ll have to start searching again so I can try this salad – it looks scrumptious! I had to search but surprisingly enough, I found them at Walmart in one of the stand alone boxes. I’m always on the lookout because they are just so yummy! I have got to use more kale in my diet. That salad looks like a great meal for me so I have to get the kale and those oranges. Now this sounds like a really interesting salad. 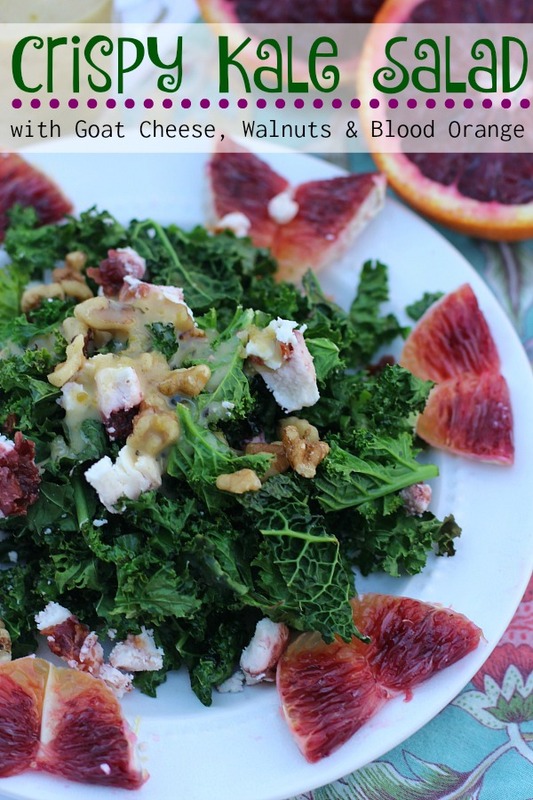 I have to admit I would never have thought of mixing together kale and blood orange! This salad looks so yummy. I haven’t made a kale salad in so long. Looking forward to giving this recipe a try. Wow, this salad looks like a dream come true, in fact, I believe I have all of these ingredients on hand. I know what I’m having for lunch tomorrow! My kids would really love this. They are HUGE kale fans (strange isn’t it?) and add in the orange and I bet they would eat the whole thing. This is a keeper! I agree winter salads seem more decadent and special. I love the blood orange. I make a blood orange vinaigrette that is amazing. This sounds like a delicious combination. Like others, I haven’t seen blood oranges at my store, but I haven’t been looking for them either. Could I substitute regular oranges, or would it change the flavor a lot? I have recently gotten on a blood orange kick…they are soooo good!! I ahven’t tried them in a salad yet. With kale having loads of calcium, this is my kind of salad! It’s been a while since I ate kale. Never had it in salad but this looks good with those blood oranges garnish.